No doubt about AMON AMARTH being one of the biggest metal bands in the World right now. The Swedes have a long history with Metal Blade that goes back to January 1998 when they released their debut album ‘Once Sent From The Golden Hall‘ via Metal Blade! 19 years later it’s time for a vinyl re-issue of this album as part of the Originals-series! On the same date Metal Blade releases the 2nd AMON AMARTH album ‘The Avenger‘, also as an Original! Mark your calendars or pre-order these items, both to be released on January, 27th 2017! ‘Once Sent From The Golden Hall‘ will be released in Europe on 180 g black vinyl as well as on opaque-orange marbled vinyl (ltd. 500), khaki-marbled vinyl (ltd. 300 – EMP exclusive) and “fire”-splattered vinyl (ltd. 200 – ebay exclusive). ‘The Avenger‘ will be released on 180 g black vinyl as well as on opaque-bloodred marbled vinyl (ltd. 500), steel-grey marbled vinyl (ltd. 300 – EMP exclusive) and “fire”-splattered vinyl (ltd. 200 – ebay exclusive). The vinyls are part of the Metal Blade Originals series that started earlier this year with the re-issues of the SLAYER titles ‘Show No Mercy’, ‘Hell Awaits’, ‘Haunting The Chapel’ and ‘Live Undead’! 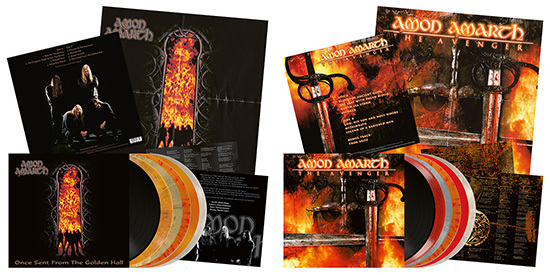 Metal Blade Records will re-issue all AMON AMARTH albums chronologically in the near future. Hence there is a limited specially designed slipcase-box available (exclusively at EMP) fitting the complete AMON AMARTH back catalog! Get it while supplies last. Pre-order your copies now at EMP or at our ebay-store!